Welcome! Come in and take a seat on board your 3-star hotel, the Comfort Hotel Davout Nation. You have arrived in the east of Paris, more precisely in the 20th district, not far from the famous Père Lachaise cemetery. 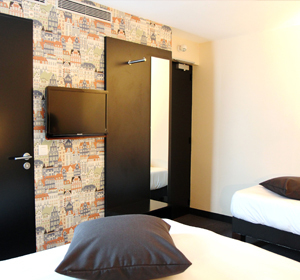 The hotel is only 200 metres from the “Porte de Montreuil” on Tramway 3b and line 9 of the Metro. 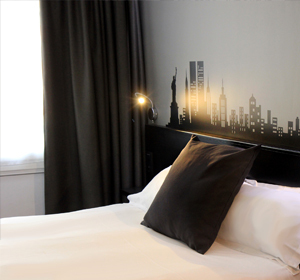 It’s the perfect location for travellers who wish to discover the “City of Light” in all its splendour. The journey is not over yet! Take a ticket for one of our 63 rooms. 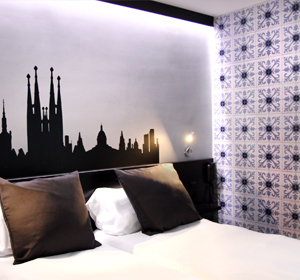 Each one has the atmosphere of one of the world’s great cities – from Amsterdam to Hong Kong, from Barcelona to New York, the atmosphere of your room is personalised with an iconic wall decoration – a special atmosphere of a faraway place for one night or more. Before setting off to explore the capital, enjoy a copious buffet breakfast and leave your luggage free of charge so you can travel around unencumbered. In less than 5 minutes’ walk, you can take the metro and Paris will be yours! If you have any questions, the staff of the Comfort Hotel Davout Nation are at your disposal 24/7. Don’t hesitate to contact us. Book on the official website and enjoy the best guaranteed price! When it's hot, sleep in the cool! All the rooms are air-conditioned. Stay connected! The hotel offers unlimited Internet access. No extra charge for luggage! Leave your luggage free of charge in our left luggage area. No extra effort required! There's a lift in the hotel. The whole hotel is accessible to people with reduced mobility! For 9€ instead of 12€ on the official website only! Enjoy! The hotel is under video surveillance 24/7. A member of staff is available at the reception 24 hours a day, 7 days a week.